Flying out of Portland International Airport at the end of our Christmas trip to Oregon, we had an opportunity to check out the Delta Sky Club Lounge and relax in quiet comfort before heading back to the whirlwind that is life in Los Angeles. 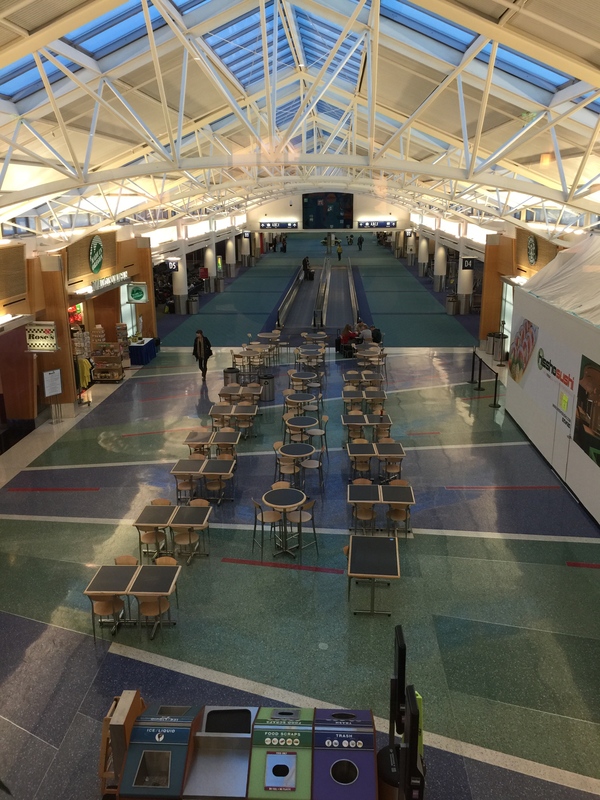 With a few hours to spare before our return flight, we were pleased to discover that the Delta Sky Club Lounge in Portland was literally a one minute walk from our gate, which made it very convenient. One of the nice things about having access to an airport lounge prior to a flight is just the ability to sit down and relax, at least for a little bit, before you deal with all the stress that is flying and traveling. And of course, the free wi-fi access and access to plenty of outlets so that you can do things like blog, and upload photos, and send pictures and communicate with friends and family back home. And finally, there’s usually refreshments and light snacks, which is much better than sitting down at your gate and going off in search of pricey food and drinks. 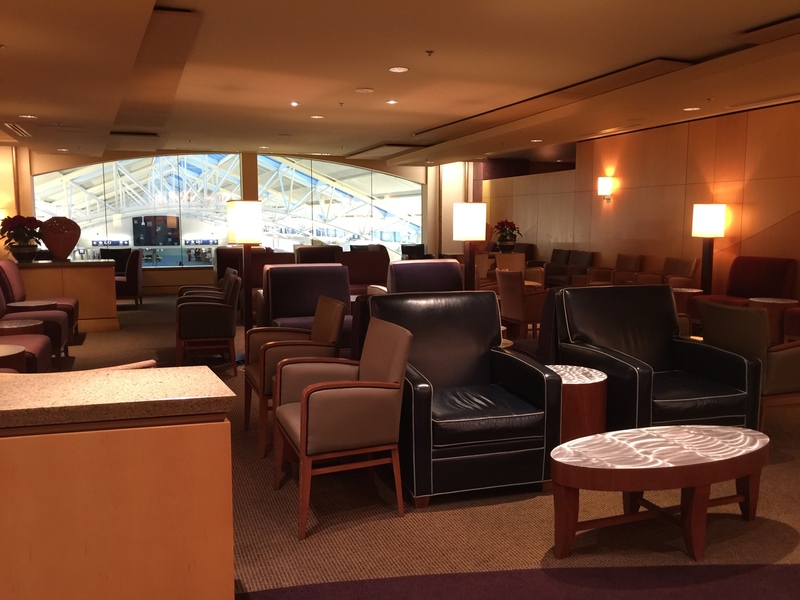 The spacious, relaxing lounge featured comfortable seating in 3 main seating areas. One open plan seating area looked out over the concourse of the airport below us. There were chairs and small coffee tables that faced these large windows so you could sit and look out over all the hustle and bustle of the activity going on in the terminal, the passengers coming and going, wandering in and out of kiosks and snack bars and in search of their gates, or airport personnel going to and fro. There was a small seating area nearby where all of the drinks and bar snacks were located. And finally there was another open area in front of a large screen television with some news programming going. This was a space being used mainly by people interested in working and being on their laptops or making phone calls. The lounge area consisted of a small corner bar area. Behind the bar was a glass shelf which displayed several cans of different types of drinks you could order from the bar tender. There wasn’t anything heavy, a couple of different kinds of beer, a couple of beers on tap, and then some mixers, tonic water, club soda, fruit juices, etc. I was more interested in the large gourmet coffee machine. Am I the only one who’s a sucker for being able to program a coffee machine to make a vanilla latte or a French vanilla coffee or a hot chocolate? Bonus, they actually had bottles of liquid flavored syrup on hand too. There was your standard vanilla, caramel and hazelnut flavors. But hey, add a few pumps of vanilla syrup into my coffee drink? Yes please! I get way too excited for these things. 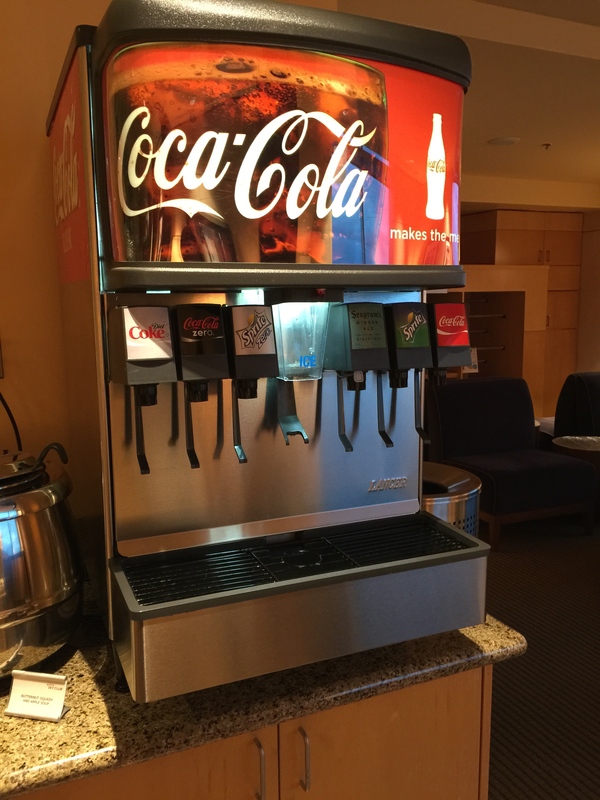 And of course, for the sodaholic in me, there was also a soda fountain where I could dispense my own, unlimited soda! This could be a bad combination for me. 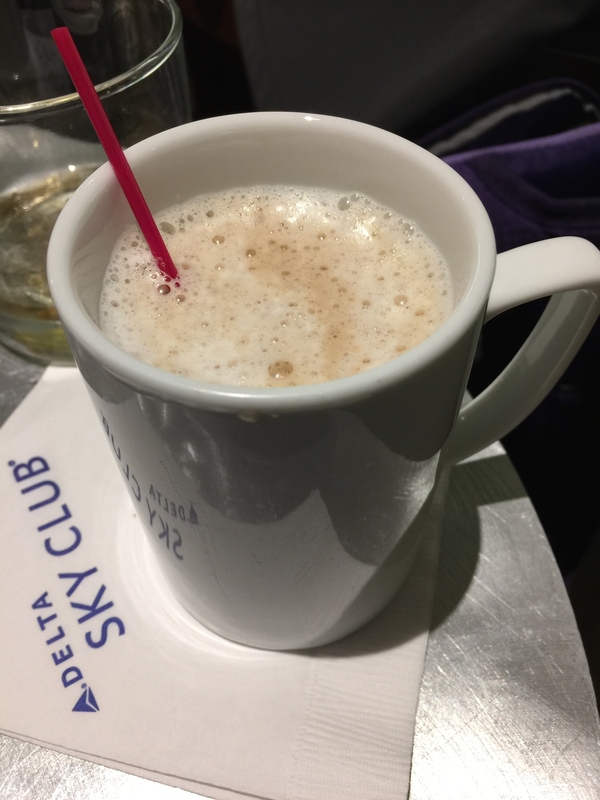 Unlimited soda and coffee right before a flight? Good thing the flight was only 2+ hours long. 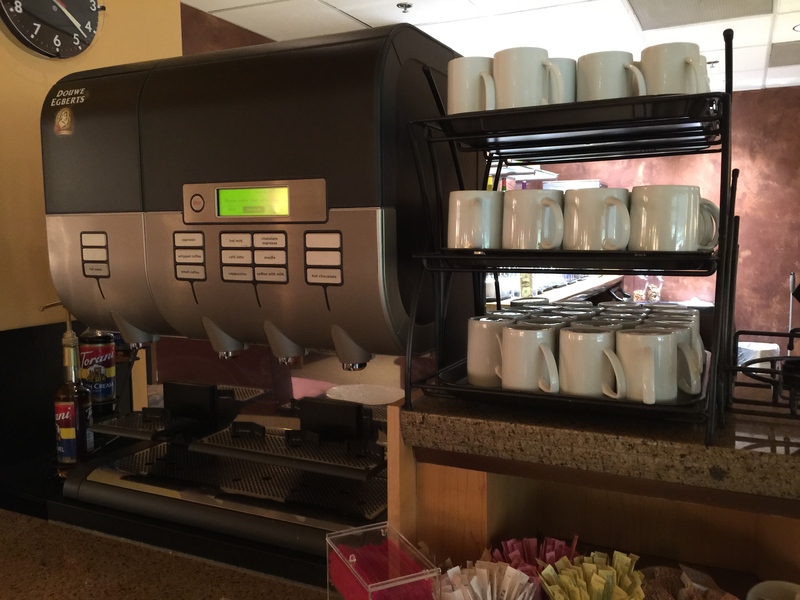 It’s so much more convenient that they let you pour your own drinks, or use a coffee machine to make your own drinks, rather than having to ask a bartender to pour drinks for you. Then I don’t feel so bad when I’m thirsty enough to drink a couple of cups of soda and a couple of cups of coffee. 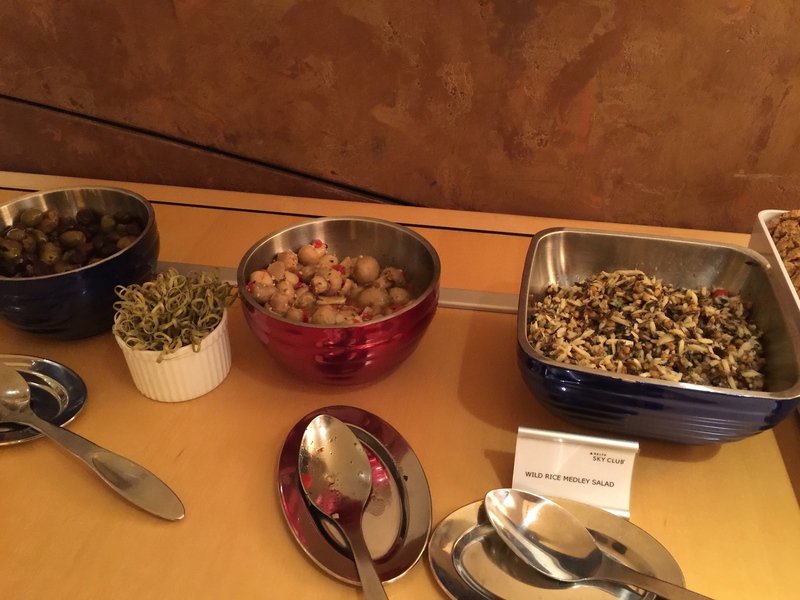 There was a little snack bar area that had some finger foods and even some soup to dine on while at the lounge. 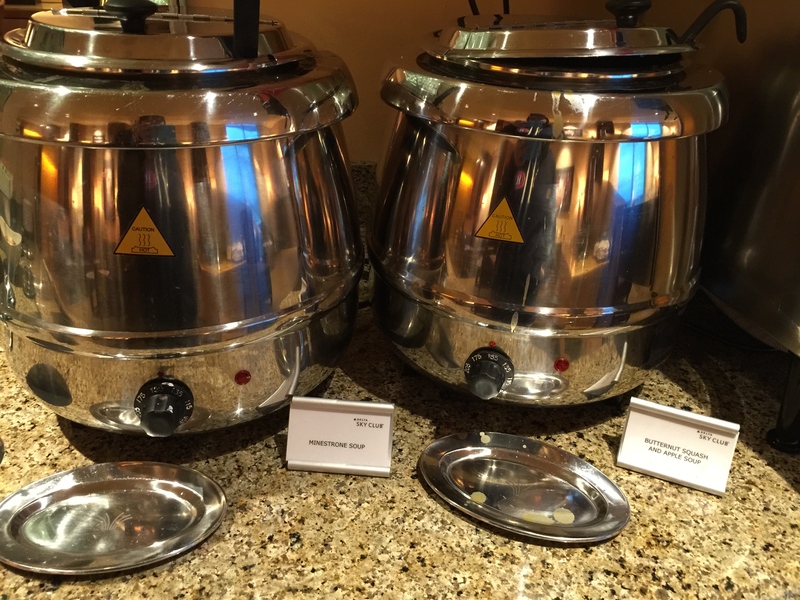 With an offering of either hearty minestrone soup or butternut squash soup, the Delta Sky Club offered a little something for everyone to help ward off the chill of a cool December night in Portland. I liked the touch of the butternut squash and apple soup, something I’d never heard of before, but somehow seemed very Portland-ish. Don’t come to the Delta Sky Club expected to be fed a meal for it for a king because you’ll be sorely disappointed. But the whole idea of the lounge is as a place to relax before you fly. 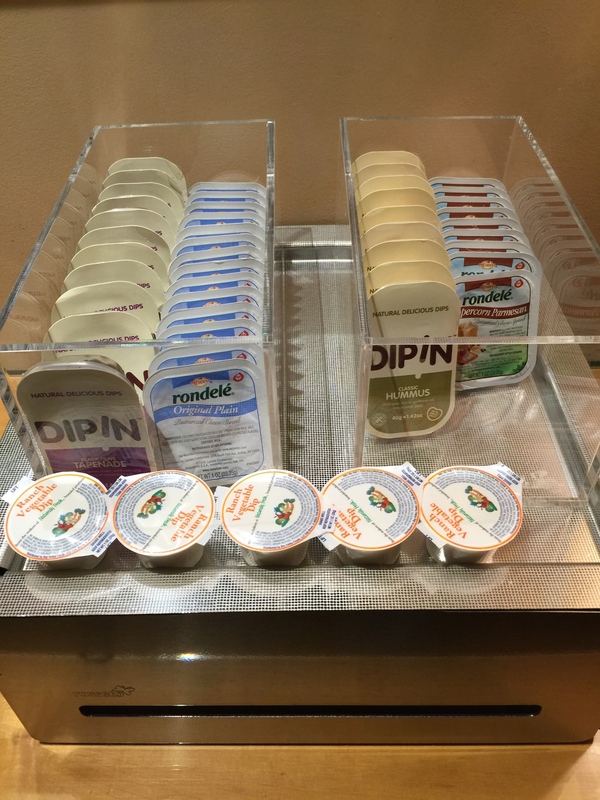 So, really, all that is needed is some light finger foods, which is exactly what the lounge offers. There was a wild rice medley salad for something a bit on the heavier side, as well as some different kinds of olives to snack on. Along with crackers, there was also vegetable dip, hummus, cheese spread and even black olive tapenade to put on the crackers. 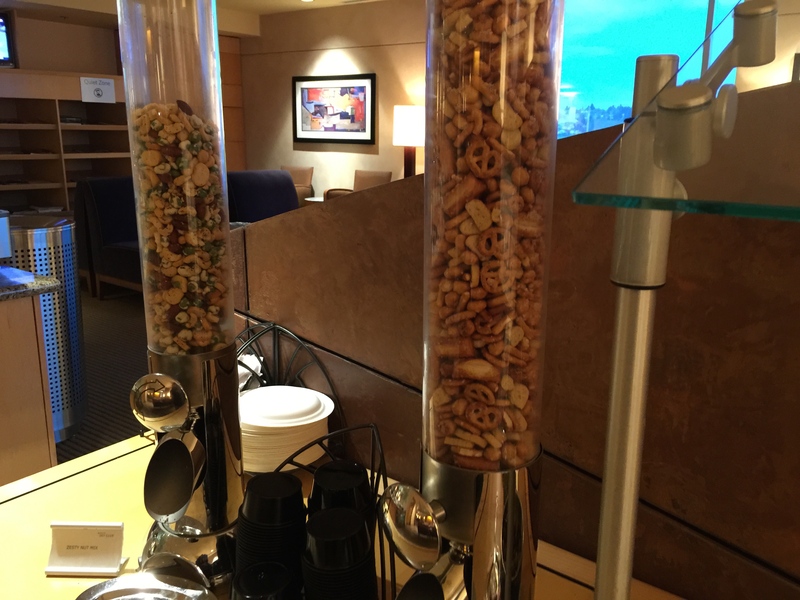 Here are some real bar snacks, zesty mixed nuts and some party mix with pretzels, and other yummy finger foods. A little bit nicer supply of the little tiny nuts and pretzels you get served on a plane. But my favorite part of the Delta Sky Club was the desserts! I’m not talking about a dessert spread, but they did offer a selection of cookies which was enough for me. We had cranberry crunch cookies, triple chocolate chunk cookies and English toffee cookies to choose from. Both my husband and I partook in a few cookies to tide us over for our flight. 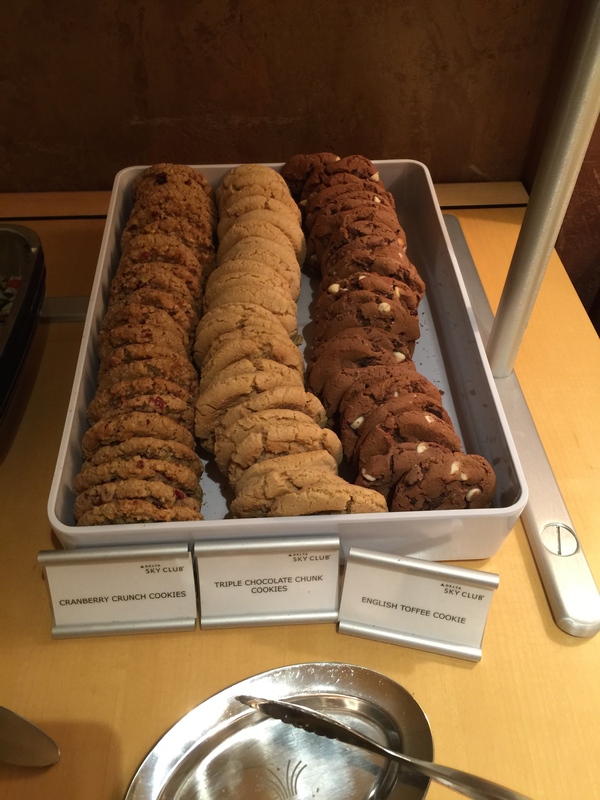 After all, where else but in Portland would you see cookie selections that included cranberry and English toffee, but didn’t include oatmeal raisin or peanut butter? I love it. The English toffee cookie was fantastic, just slightly sweet from the toffee, but perfect with the chocolate in the cookie. Flying anywhere, at any time, no matter how long, or short, the journey may be can be a stressful time. Packing your bags, checking in for your flight, going through security, etc. can be a hassle. Luckily, waiting at the gate anxiously for your flight doesn’t have to be when you’ve got access to an airport lounge to just relax and unwind, even if only for a few minutes. 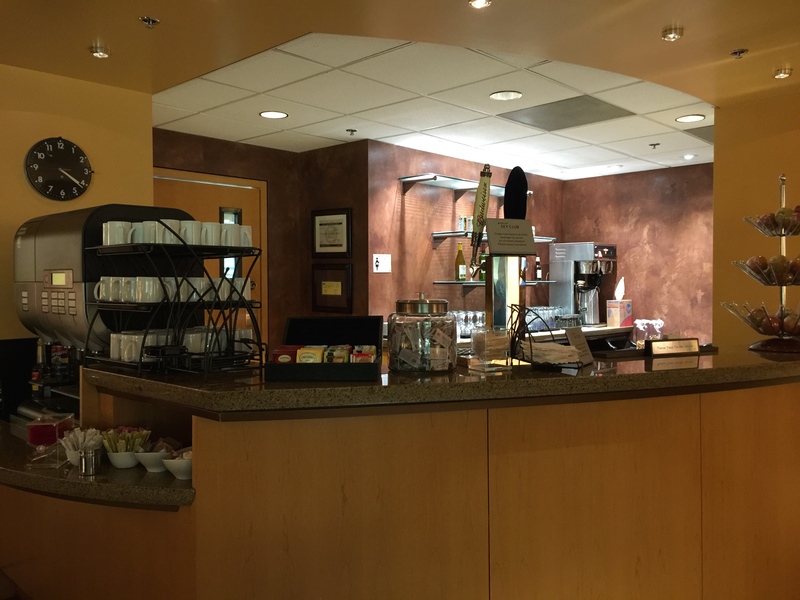 The Delta Sky Club at Portland International Airport was a nice, relaxing setting for my husband and I to wait for our return flight back to Los Angeles after a wonderful few days spent in Northern Oregon. While this particular lounge might not be the best airport lounge I’ve ever used, it did the trick and offered all the services I needed in advance of my flight. Really, that’s all you can ask for.